Confessions of a #ghostwriter! Meet happily-hidden talent, Lynn Wolf. My guest today is Lynn Wolf, an award-winning poet and a published editor and author. She has also written, produced, and acted for the independent filmmaking community. But, of all her talents, I'm most intrigued by Lynn's ghostwriting. She kindly agreed to share some insight into that field. If you've ever seen the movie Singin' in the Rain, you know all about ghostwriting. The performer is on stage, entertaining the audience while the singer is behind the curtains providing the voice. Hello, I'm Lynn Wolf, and I'm the voice behind the curtain. I'm a professional ghostwriter, and I'm able to fulfill my love of writing by helping writers fulfill their love of storytelling. While some people consider it 'cheating' to have someone else write their book, that's not what ghostwriting is about. At least, that's not what professional ghostwriting is. What we do is help people who have great stories to tell, but might not have all the writing tools to tell it. Quite a few times I've also been approached by a storyteller whose native language is not English, and they just need someone to write their story in English. Either way, it's a win-win situation for both of us. I wasn't always a ghostwriter; I've done my fair share of writing in my own name, in various pen names, and have gone through the same submission and rejection process as every true aspiring writer. I've studied, practiced, and I continue to refine my craft with workshops and daily writing exercises. When I started editing for other writers, I found that I loved coaching, teaching, and showing other writers how to develop their own writing, and from time to time, a few people asked me to write for them. They had a story, but they didn't have the confidence or the time to study the craft. Well, I had the time and the craft, so my services evolved to include ghostwriting. The best gig for me is when I'm approached by an author who knows their characters, knows their story, and has a good idea of where it begins and where it ends. My job, then, is to flesh out these characters and tell that story in such a way as to please the readers. So far, my collaborations have been both pleasant and successful. It's not important to me that my name be on the cover; I'm just proud to do the best I can and to see a smile on the face of the storyteller who created the world inside. Being a ghostwriter isn't for everyone; it's difficult sometimes to quench the ego, or to write a story as someone else sees it when I see it differently. I must maintain an open mind at all times and remember that the story isn't mine; I'm just painting by numbers – the picture my client drew needs color, and I wield the brush. One of the best payoffs for me, though, is that I am deeply inspired by the people I work for. I find myself driven to write more for myself and finish some of those dusty WIPs I set aside long ago. I'm happier about writing and don't see it as a job so much as I appreciate it as a gift. When I first started studying the craft of writing, I couldn't have predicted that I'd end up as a writing coach and ghostwriter – and loving it –but that's exactly where I am. I love my clients, love their stories, and I'm grateful that they trust me with the brilliant expressions of their imaginations. Want to hire Lynn Wolf? Inquiries may be sent via email to lew[at]lynnellenwolf[dot]com. Today's guest author was determined to see her fictional world through her character's eyes, or, more accurately, through her character's other four senses. Elizabeth Watasin's Medusa features the romantic adventures of a blind woman in an alternative Victorian London. Intrigued? Read on! A Dark Victorian Penny Dread. Set in an alternate 1880, mechanical and supernatural London, I'm excited about this story because not only is it my first full romance (I usually write paranormal mystery and adventure with romance on the side), it features blind people as principle characters, having adventures and falling in love. Writing with the perspective in mind of a protagonist blind nearly all her life was (dare I say it?) quite an eye-opener, leading me to rely on our auditory, olfactory, and haptic senses to convey the story. The result was a very sensual experience, especially when I introduce that Elvie Chaisty, my heroine in MEDUSA, likes exploring the marble antiquities in the British Museum by touch. I also like my characters empowered, in that Elvie should not feel deficit as a blind person (she has no longing to be sighted), desires to be accepted by sighted people (she certainly has an opinion on the sighted's lack of understanding of her world), and doesn't need to be the “facilitator”, shall we say, of a sighted person's personal heroic journey. Elvie gets to be the adventuresome heroine, which, not too much to my surprise, emulates a real life sightless adventurer I was happy to discover during my research: James Holman (1786-1857), who set out to travel the world. With only enough money to travel “native”, and often alone, Holman managed to journey through (per the title of his book), Africa, Asia, Australasia, and America. Now I don't have Elvie travel beyond London, but just experiencing messy, noisy, smelly, and sometimes astounding Victorian London itself, beyond the doors of the Institute of the Blind (where she resides with her friend and stick for hire, Ellie Hench), is adventuresome enough. To boat for the first time down the Thames, hear Westminster Clock chime, or enjoy the air and sunlight in bucolic Brompton via electric horseless carriage can be singular experiences to a blind person's senses. I didn't give Elvie super abilities, but the virtues and fallacies of haptic perception in a sighted world. At least, I tried my best to do so, and it was a rewarding experience being in her world. Frankly, I was reluctant to leave it once I typed “the end”. As a reader, you will join her in adventures as one blind, fall in love as one blind, and thus experience more about our world than we sighted can know. 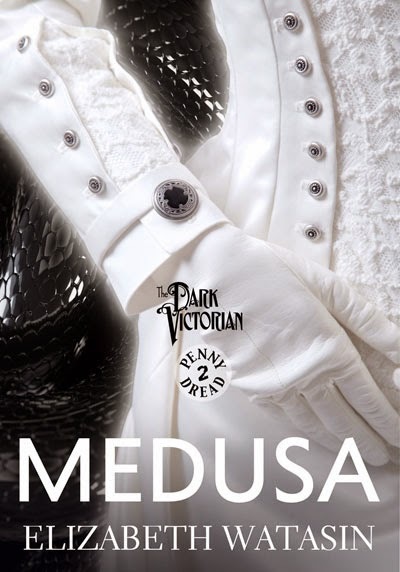 I hope you enjoy MEDUSA: A Dark Victorian Penny Dread. Learn more about Elizabeth Watasin on her website. Purchase Medusa on Amazon and B&N. Those first couple of days without blankie were rough, but I soon learned other age appropriate coping stragedies. I played with Barbie and her Beach van. I picked up a book. I began coloring. I loved playing with Matchbox cars. Soon my imagination grew and I didn't need blankie anymore. Brady's Lost Blanket is about taking that first step. It's a great message for children. Growing up isn't easy. There are all kinds of challenges, but learning how to get along without a blankie is usually the first one a child faces. In the story, Brady has a lot of support from his parents who offer him other ways to deal with the anxiety of losing his blanket. I hope that when other children read the story they realize that while it may be upsetting at first, letting go of blankie and embracing new things can be fun and they'll be all right. Question for you: Did you have a blankie growing up? Did you know someone who had a blankie? You can learn more about Stephanie Burkhart on her website. Follow her on Facebook and Twitter. 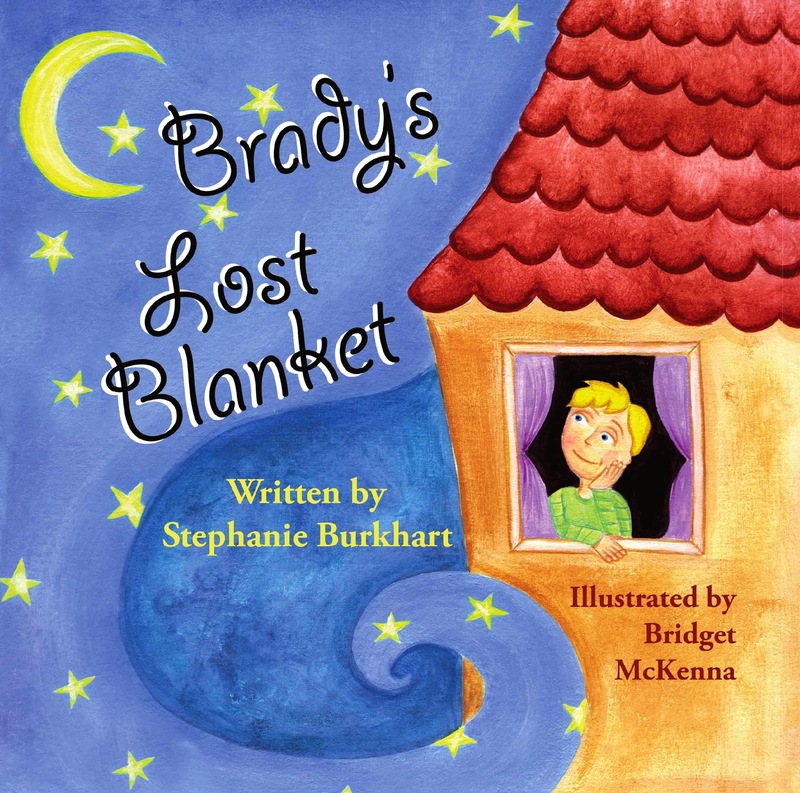 You can purchase Brady's Lost Blanket at the 4RV Publishing store, on Amazon, or on B&N.